Little, Brown Books for Young Readers, 9780316070133, 40pp. They were each born with the gift of gospel. Martin's voice kept people in their seats, but also sent their praises soaring. Mahalia's voice was brass-and-butter - strong and smooth at the same time. With Martin's sermons and Mahalia's songs, folks were free to shout, to sing their joy. On August 28, 1963, Martin Luther King, Jr. gave his famous "I Have a Dream" speech from the steps of the Lincoln Memorial, and his strong voice and powerful message were joined and lifted in song by world-renowned gospel singer Mahalia Jackson. It was a moment that changed the course of history and is imprinted in minds forever. 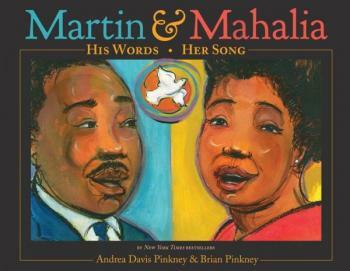 Told through Andrea Davis Pinkney's poetic prose and Brian Pinkney's evocative illustration, the stories of these two powerful voices and lives are told side-by-side -- as they would one day walk -- following the journey from their youth to a culmination at this historical event when they united as one and inspiring kids to find their own voices and speak up for what is right. Andrea Davis Pinkney is the author of many acclaimed picture books and young adult novels, and she received a Coretta Scott King Book Award Author Honor for Let It Shine: Stories of Black Women Freedom Fighters. She is a children's book editor at a major publishing company. Brian Pinkney has illustrated numerous books for children, including two Caldecott Honor books, and he has written and illustrated several of his own books. Brian has received the Coretta Scott King Book Award for Illustration and three Coretta Scott King Book Award Honor medals. Andrea and Brian are a husband-and-wife team who live with their children in New York City.